Two and a half years ago, year 2013 seemed impossibly far away. Graduation seemed to be a nearly unattainable feat. I am now counting down the dwindling number of days to what will be one of the proudest days of my life so far. 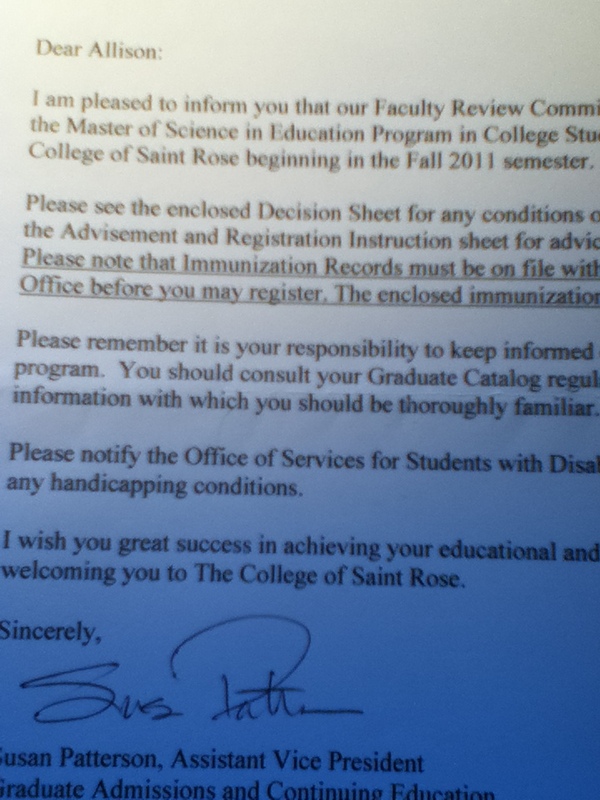 Today I stumbled across my Saint Rose graduate school acceptance letter. I was cleaning out my desk, since I now have more time than I’ve had in quite a while to take care of a variety of personal to-do list items. I was officially accepted on my birthday in 2010. I remember receiving the personal phone call from graduate admissions on my drive home from work like it was yesterday, my excitement in realizing I had been accepted to the start of a new phase of my life. As I further shuffled through my folder labeled “Grad Stuff”, I really began to identify how I have and have not changed since beginning graduate school. I came across several sheets of loose leaf paper, where I had reflected about my experiences and written them down to prepare for my graduate school interview. This is a way I haven’t changed; as a Graduate Assistant in the Career Center, I often give students this advice while educating them about preparing for interviews, and I am proud I knew how important steps like this are even before formally learning about its importance. 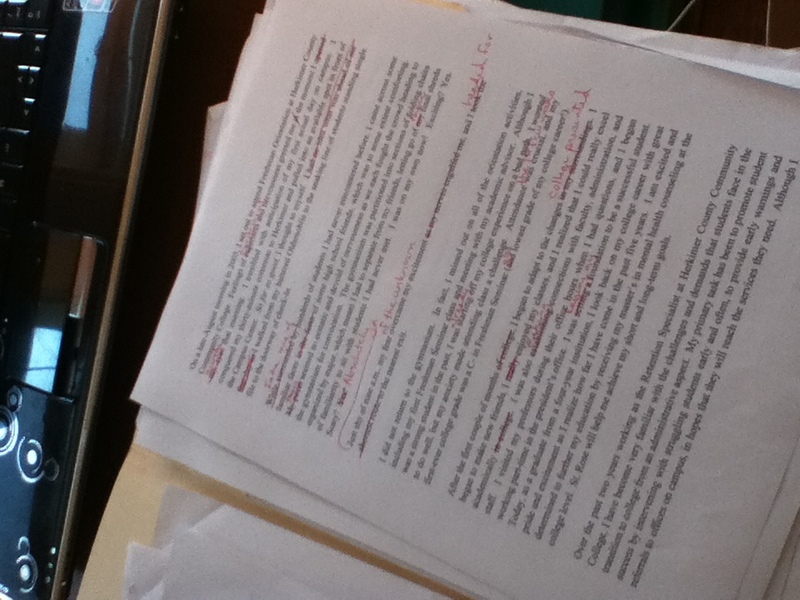 I also found my personal statement for grad school, or at least a draft of it that I had vigorously taken a red pen to, clarifying my word choices (in classic Allison fashion). In this essay, I spoke about my experience at Freshman Orientation the summer after high school. I reflected on the anxiety I experienced on that very first day, how it almost kept me from obtaining my goal of being a successful college student and graduate, and how my connections to the student affairs staff at my institution played a crucial role in my success. 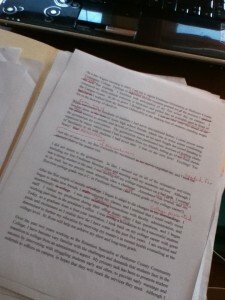 Making the edits on my personal statement (some things never change). “Just shy of 9 a.m., my fear of the unknown overcame my excitement, and I headed for the nearest exit.” This statement summed up my freshman orientation to college; I didn’t even make it to the President’s welcome speech (who, just a week later, I would start working for on-campus). I had also written in my personal statement, “I thoroughly understand the physical, mental, and emotional struggles that come with the transition from the comfort of your hometown to a place where nearly everything is unfamiliar.” This isn’t true, I know this now. Even just last year, halfway into my graduate program, I still felt doubtful that I had the necessary knowledge and skills to support a diverse body of students. It was a classic experience of how much you realize you do NOT know with the more that you learn. As graduation nears, I am amazed by my passion and confidence in the skills I have developed. As an emerging professional, I realize I have much yet to learn and must continue to educate myself through reading and professional development. Toward the end of my application essay, I wrote, “My commitment to earning a master’s degree is unyielding.” In stating this, I was absolutely right. 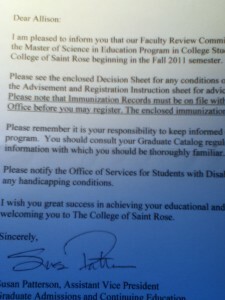 By the time you graduate with your degree from Saint Rose, you will feel ready to transition into a professional role. You will be glad you decided to start your further education and commit to it. And you will be so, so proud.